Flower size: 10mm (approx. 3/8"). Petal: polish edge around brush finish. Length: 7 1/2" + 1/2" extension. Weight: approx. 8.7 grams. Stamp: 925. Stone: Cubic Zirconia (CZ). 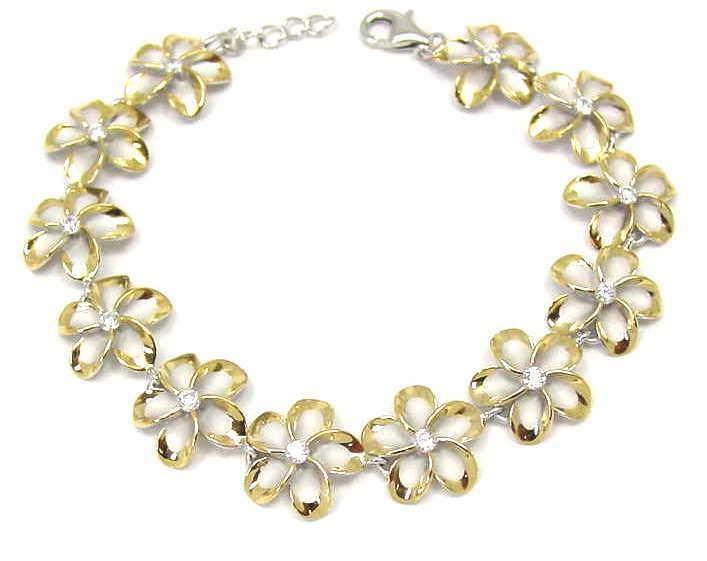 Brand new solid 925 sterling silver Hawaiian fancy Plumeria flower bracelet. Length: 7 1/2" plus 1/2" extension. Flower size: 10mm (approx. 3/8") in diameter. Petal design: yellow gold plated edge around brush finish. Weight: approx. 9.1 grams. Stone: (CZ). Rhodium finish so it has the white gold with yellow gold look. Flower size: 12mm (approx. 1/2"). Stone: clear Cubic Zirconia (CZ). Stamp: 925. Length: 7 1/2 inch. Slipper size: 1/4" wide and 9/16" long. 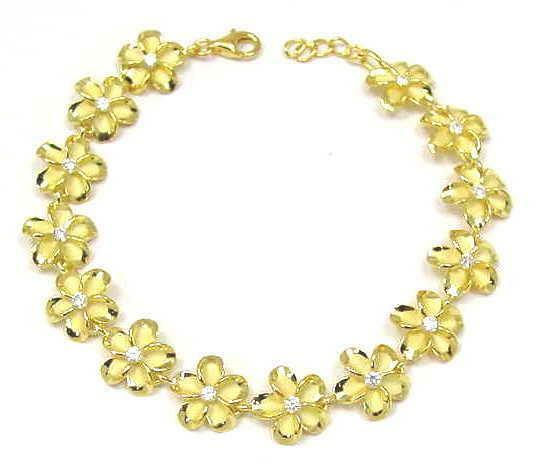 Yellow gold plated flower size: 7mm (approx. 1/4"). Rose gold plated flower size: 5mm (approx. 3/16"). Petal: shiny high polish. Weight: approx. 10.4 grams. Stone: Cubic Zirconia (CZ). Stamp: 925. Flower (silver, yellow gold plated, rose gold plated) size: 15mm (approx. 5/8"). Length: 7 1/2" + 1/4" extension. Weight: approx. 16.80 grams. Petal: diamond sand blast finish. Stone: Cubic Zirconia (CZ). Stamp: 925. Flower size: 12mm (approx. 1/2"). Petal: polish edge around brush finish. Length: 7" + 1/2" extension. Weight: approx. 10.5 grams. Stamp: 925. Stone: Cubic Zirconia (CZ). Flower size: 12mm (approx. 1/2"). Petal: polish edge around brush finish. Length: 7 1/2" + 1/2" extension. Weight: approx. 11.3 grams. Stamp: 925. Stone: Cubic Zirconia (CZ). Turtle size: 14.50mm (approx. 9/16") wide and 13.50mm (approx. 1/2") long. Flower size: 10mm. Length: 7 1/8" + 1 1/2" extension. Metal: 925 sterling silver. Weight: approx. 10 grams. Stamp: 925. Flower size: 10mm (approx. 3/8"). Length: 7 1/8" + 1 1/2" extension. Metal: 925 sterling silver. Weight: approx. 12 grams. Stamp: 925. Brand new solid 925 sterling silver Hawaiian fancy Plumeria flower bracelet. Length: 7 1/2" plus 1/2" extension. Flower size: 15mm (approx. 9/16") in diameter. Petal design: yellow gold plated edge around brush finish. Weight: approx. 13.5 grams. Stone: (CZ). Rhodium finish so it has the white gold with yellow gold look. Brand new solid 925 sterling silver Hawaiian fancy Plumeria flower bracelet. Length: 7 1/2" plus 1/2" extension. Flower size: 15mm (approx. 9/16") in diameter. Petal design: polish edge around brush finish. Weight: approx. 13.5 grams. Stone: Cubic Zirconia (CZ). Stamp: 925. Rhodium finish so it has the white gold look.